The “big thing” is that I touched a bit the surrealism after a very long time.,,a very very long time! OMG, such a long long time !!! Sorry fort this but I am amazed myself of the big gap since I finished a surrealist painting. I think there are almost two years now! 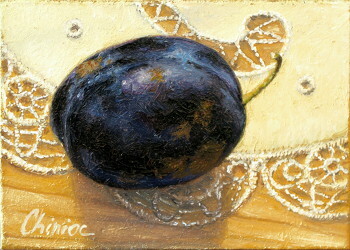 The art card ACEO depicts a plum over a lace tablecloth painted as much realistic I could. 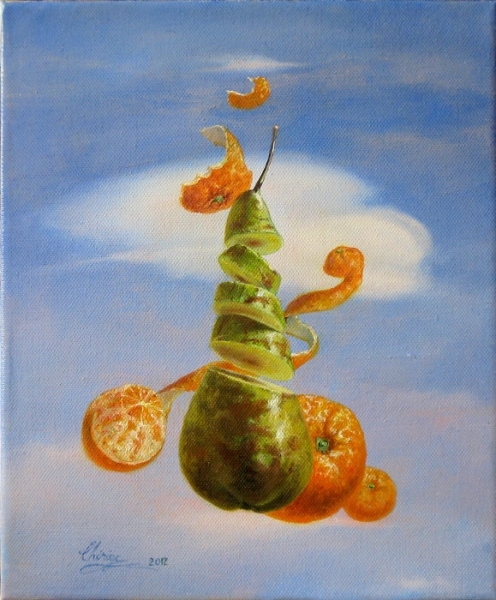 The surrealistic oil painting of fruit depicts some oranges: two whole oranges, another one half peeled and some orange peel flying around. The pear is sliced and it is suspended in the air with all those oranges flying around it.